The Thompson 350 Bandsaw is designed to offer reliable smooth cutting operation delivered by a direct drive motor system. 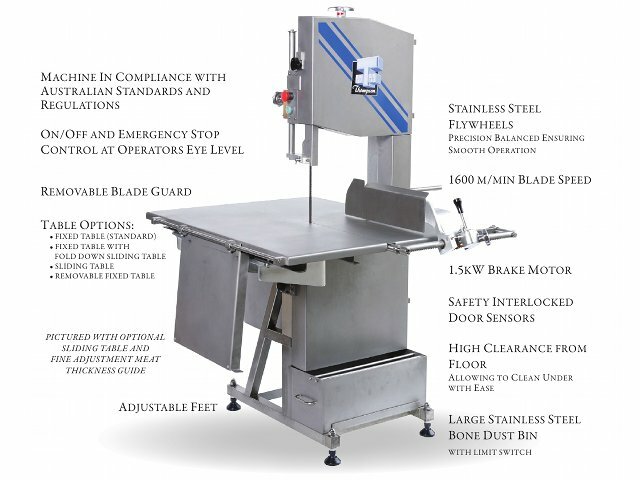 The Thompson 350 Bandsaw is constructed from high quality stainless steel and offers superior low maintenance operation suitable for all environments including industrial processing plants, supermarkets and butcher shops. It is designed to suit environment where space is at a premium. The Thompson 350 Bandsaw offers safety features that maximise safety to the operator and other persons in close vicinity. Limit switches are fitted on doors and bone dust bin. The blade speed and efficient design of the Thompson 350 Bandsaw significantly improves the cutting action. Portion cutting is straight and accurate.